This bacterial growth curve reflects the events in bacterial population when they are grown in a closed system of microbial culture of fixed volume (i.e. 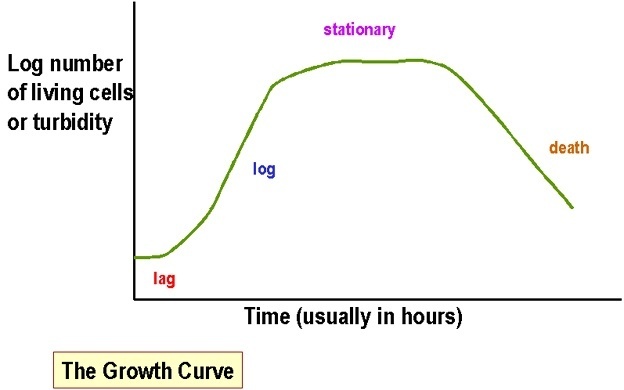 batch culture).The typical growth curve for population of cells can be divided into several distinct phases called the lag phase, log phase, stationary phase and death phase. When a microbial population is inoculated into a fresh medium, growth usually does not begin immediately but only after a period of time called the lag phase, which may be brief or extended depending on the history of culture and growth conditions. Exponentially growing culture inoculated into same medium: no lag phase. Old or stationary culture inoculated into same medium: lag phase (time required for bacteria to synthesize essential cell constituent and to be able to go for binary fission). In this phase, bacterial cell numbers doubles during each unit time period (i.e. generation time). For example: a culture containing 1,000 organisms per ml with a generation time of 20 minutes would contain 2,000 organisms per ml after 20 minute, 4,000 after 40 minute, 8,000 after 60 minutes, 16,000 after 120 minutes. The generation time of most bacteria is between 20 minutes to 20 hours. Mycobacterium tuberculosis and Mycobacterium leprae has longer generation time. When the cell number from such experiment is graphed on arithmetic coordinates as function of elapsed time, one obtains a curve with a constantly increasing slope. The rate of increase in cell number is slow initially but in later stage the cell numbers increases explosively. The rate of exponential growth varies between bacterial genera (i.e. genetic characteristics of bacteria) and is also influenced by cultural conditions. Logarithmic growth can be maintained using a device, chemostat. Chemostat has reservoir and growth chamber. Fresh medium is continuously added to the growth chamber and the old medium is taken out. Interesting and unbelievable fact about bacterial growth: If a single bacterium (having weight 10-12 gram) with a generation time of 20 min continued to grow exponentially for 48 hour, produce a population that weighed about 4000 times the weight of the earth. If incubation continues after a bacterial population reaches the stationary phase, the cells may start dying. Cell death may be due to cell lysis and this is also an exponential process but much slower than that of exponential growth. During the decline phase many cells undergo involution, i.e. they assume a variety of unusual shapes. Spore forming organisms forms spore as a part of survival mechanisms. Does bacteria have programmed cell death ? if so whats trigger it in stationary phase? thanks for the info. answered some of my questions. hello. is it possible that a bacteria can skip one of the phases?